I’m going to tell you a little story. I’m sure that you’ll find it familiar, more’s the pity. A few weeks ago, Lady A and I were sitting in a quiet pub. It was an unusual pub, being converted from a former waiting room. In the pub, they served beer from a very local brewer whose beers I had not yet tried. There weren’t many people in the pub, three or four local men at the bar, chatting quietly, a middle-aged couple at a table, a pair of blokes at another table, and us. I was settling in nicely, the oddness of the pub was starting to work for me, I was enjoying the local beers, the atmosphere was friendly and cosy and I was beginning to feel comfortable. At this point, a man entered the pub from a back door. I didn’t see him at first, but I certainly felt the change in the atmosphere. The middle-aged couple immediately got up and left. The good-natured chatter round the bar froze. I looked up to try to see what had changed. The man was probably about forty years old and thickset. A single thick eyebrow covered both eyes. His hair was shaved close to his scalp, revealing several bright white scars across his skull. He was lurching slightly as he walked, and when he spoke, in a very loud and aggressive voice, his words were slightly slurred. Clearly, he had tanked up before he came to the pub. ‘Out?’ growled the thug, ‘He’s f****** gone out when he promised me a f****** pint?’ The barman scuttled into the back room. I’m glad he did, otherwise I reckon he’d have earned himself a punch for his temerity. Fortunately at this point, Baldy returned. He looked like a professional man, a doctor, maybe, well dressed, understated. He quietly took the thug aside and bought him his pint. Then the whole sorry tale of the thug’s day was revealed, in loud slurry passages filled with obscenities and his vile opinions of just about everybody he knew. As he was still standing at the bar, I felt no desire to get myself any more beer. I distinctly felt a ‘What are you looking at?’ just waiting to come my way. The two blokes sitting at the other table left their beer glasses on their table and departed. I waited until the thug went out for a cigarette before I returned my empty glasses to the bar. The young barman took my glasses and quietly apologised for ‘him’. We then waited until he came back in before we went out. It was a quiet night in the pub, but still they lost over half their custom because of one man. Clearly the middle-aged couple were local and knew what to expect, that’s why the vamoosed so quickly. The two blokes and us were not local, but soon got the measure of what was unfolding. Behind the bar were two young people, a lad aged about twenty and a girl of about the same age. The landlord did not appear to be present. This, then, is my point. Why should the bar staff have to put up with customers like that? Why should other customers have to put up with customers like that? Why should the business put up with customers like that? The answer’s simple: they shouldn’t. We all know pubs that have ‘problem’ customers. Some are just a bit loud or annoying. Others are more serious. This guy may have been a bit extreme, a conversation with another local in another pub confirmed that the man was well known, and ‘handy with his fists’, and not just with other men. That explained his air of barely repressed rage and violence. There should be zero tolerance of this sort of behaviour. He frightened the staff, the customers, and cost the pub the profits from several more pints. The landlord was not on hand, but it seems that would not have made any difference. The man was clearly well known, and yet had not previously been barred. A breach of the peace is defined as ‘threatening, abusive or insulting behaviour’. This thug ticked all three boxes. He should have been barred long ago. He should be barred from all the local pubs. If you have a ‘problem customer’ in your local who just ruins the night simply by walking into the pub, speak to the landlord, and ask for him (or her, let’s not be sexist) to be barred. Let’s reclaim our pubs from the thugs. Zero tolerance. York was traditionally founded in AD 71 by the invading Romans, but there may well have been a settlement on the banks of the river Ouse before then. Its name has changed gradually over the millenia, initially called Eboracum by the Romans, Eoforwic by the Anglo-Saxons, Jorvik (almost exactly the same pronunciation as Eoforwic) by the Vikings, and now simply York. Much of the centre of the town is still filled with narrow mediaeval streets, with overhanging mediaeval buildings. Some of the streets still follow the layout of roads in the Roman fort. In all that time, it’s not surprising that some damned fine pubs have come into existence. There are more than one pub which claim to be the oldest in York, but the most famous must be Ye Olde Starre Inn, off Stonegate, which has a gallows sign spanning the street. There are two small rooms, one on each side of the main entrance, and a larger room housing the bar. I’ve visited this pub on a number of occasions, there is usually a reasonable selection of ales on the bar, but it’s a very busy pub, right in the heart of the tourist district. The crowd is mixed, but predominantly young. 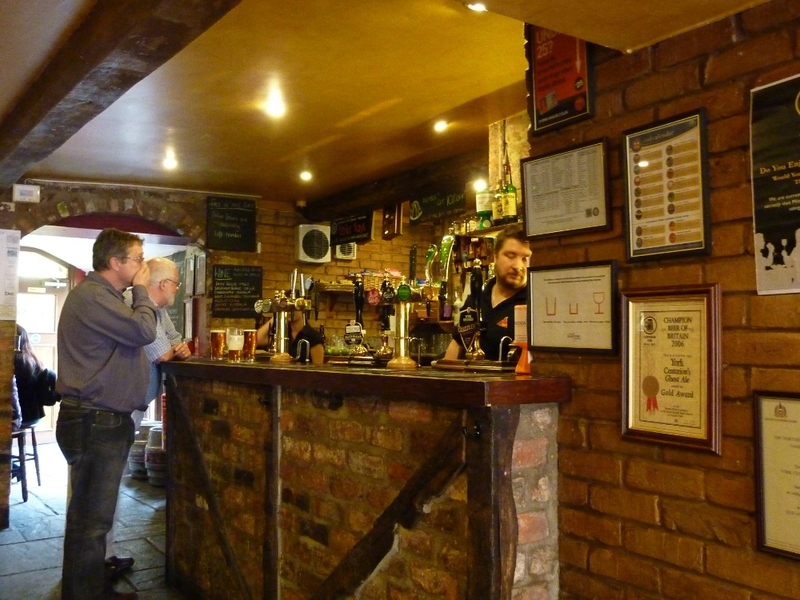 Brigantes Bar, on Micklegate, near Micklegate Bar, is York CAMRA’s pub of the year for 2011, as it was in 2008. This is a spacious, roomy bar serving beers mostly from Yorkshire. The lack of any soft furnishings gives the place a utilitarian, though not uncomfortable feel. It also means that it’s very noisy, with nothing to muffle the voices of the early-evening, post-work crowd. This is especially noticeable if, like me, you end up sitting next to a crowd of long-bodied, short-legged men with huge voices and double chins. It seemed that they thought the whole pub would be fascinated by their ‘marketing strategy solutions’. The beer was well-kept and there was a good choice on during my visit. I started with a Hawkshead Cumbrian 5 Hop, a 5% golden ale. This is massively hoppy and massively bitter. I couldn’t help noticing the hint of shudder that came with it. Moving swiftly on, I had a Dark Star Old Chestnut, a delicious 4% mild. It’s very smooth, malty and husky. The pump clip says ‘mellow’ – yeah, I’d agree with that. Next was Leeds Samba, a 3.7% golden ale – light, citrussy, hoppy and with a dryness that grows towards the end. My final draught at Brigantes was Bowland Sawley Tempted, a 3.7% bitter. It’s quite smooth, light and hoppy. Lady A detected floral hints that I didn’t. This is an easily drinkable ale, but not huge on actual flavour. Back towards the centre of touristy York, we find the Golden Lion on Church Street. This is another pub that has a claim to an ancient pedigree. It’s a large, open one-room affair, with a large bar serving usually five or six real ales. The ales are usually well-kept, but if you get a duff ‘un (it can happen to anyone), there’s no problem taking it back for a replacement. Pub food is quite good here, well cooked and speedily delivered. This pub tends to attract a younger crowd, and is serviced by a bouncer at the door to prevent the entry of undesirables. Strangely, he let me in. The Maltings lies just within the walls at Tanner’s Moat, by Lendal Bridge. It’s another old building, having been a pub (under various names) since 1842. Black Sheep is a regular, along with six guests. Unfortunately, I had only time for a short stay, and managed two beers. Firstly, Junction Trainspotter, a 3.8% brown bitter. It is bitter, too, a bit brash. Not bad, but some unpleasant undertastes to its slightly harsh malt flavour. Secondly, I had a Bartram’s Stingo. I’m not quite sure what this beer was supposed to be. It was orange in colour, and weighed in at 4.5%. A bitter, maybe. And yet it wasn’t bitter. In fact it was sweet, very sweet and smooth, but no actual flavour that I could discern. I wanted to stay longer in the Maltings, but it wasn’t possible, so it’s up there on my list for my next visit to York, early in 2012. There are many, many more fine pubs in York, and I’ll be following this article up with more on York later on. In the meantime, I can only encourage you to go to York to experience this delightful city and its great pub heritage for yourself. Note. I’m very pleased to see that the Last Drop is included in the 2012 GBG. In every walk of life, we come up against situations or attitudes that disappoint us. We expected better, and we were let down. This applies to pubs and beer as much as to anything else, perhaps even more regularly. I was recently disappointed by two pubs, and I think that it’s right to speak about the pubs that fail to deliver as much as those which thrill, excite and satisfy us. My expectations for a pub are simple and unsensational. I expect good beer, served with politeness. I don’t expect friendliness. When I get it, it’s a bonus. I do, however, expect publicans and bar staff to be polite. They, in turn, should expect no less of me. My first recent disappointment happened in the Black Horse, in Old Bolingbroke, Lincolnshire. 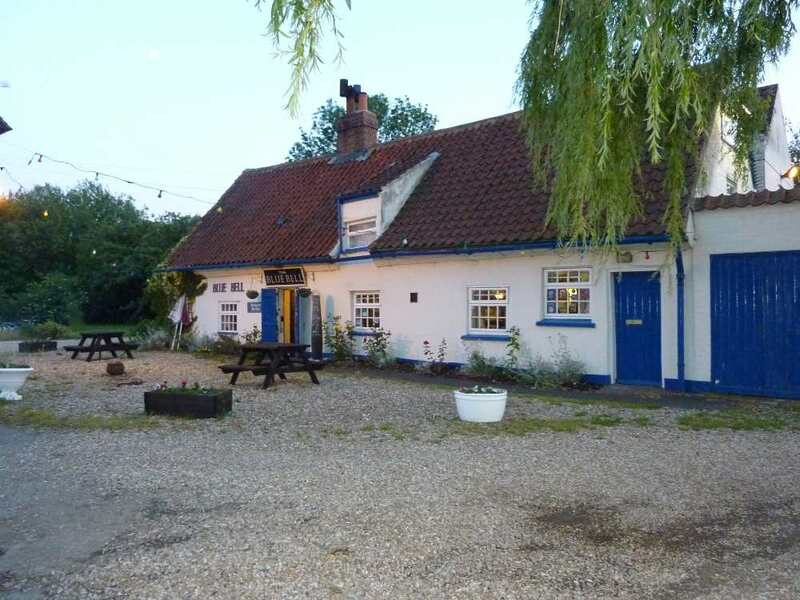 This is a smallish village pub opposite the ruins of Bolingbroke Castle where the future King Henry IV was born in 1367. Lady Alebagger and I had driven out specially to this pub, having read its entry in the Good Beer Guide 2011. It was a Sunday evening and the pub wasn’t very busy. A few locals were sitting at the bar chatting with a man who I assume was the landlord, though I could be wrong, and a barlady. 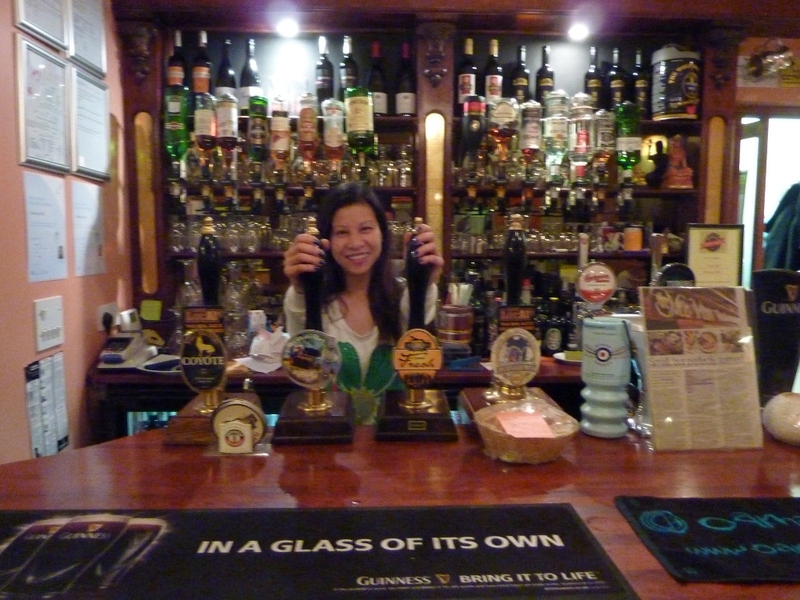 There were three real ales on the bar, Milestone Black Pearl, Milestone Crusader and a Spitting Feathers brew. I asked for a half of each of the Milestone beers. The barlady pulled my half of Crusader and then started pulling from the Spitting Feathers pump. I stopped her, saying that I wanted Black Pearl in the second half. She moved to get another glass, but was swiftly intercepted by the man I assumed to be the landlord. He took the part-filled glass off her and proceeded to pull Black Pearl into it, on top of the unwanted Spitting Feathers. I was stunned, literally. I looked at Lady A and she looked at me. I KNOW I should have stopped him, and asked for a clean glass, but I was in shock. Bit of British reserve as well, perhaps. Mustn’t complain, y’know. I cannot report which of the two mixed beers in my glass was sour, but one of them certainly was. I didn’t take it back to the bar, I just left it. We left, very disappointed in a pub which had seemed to promise so much, and yet delivered so little. For what it’s worth, the Crusader was in acceptable condition. There is a section at the back of the GBG which encourages you to recommend or criticise a pub that you have visited. You can do this on paper – the form is provided at the back of the GBG, or by email, as I did. My second recent disappointment was just three days later, when we were visiting the little village of Happisburgh on the Norfolk coast. In the middle of the village, up a steep little hill, is the House on the Hill. It looks good from the outside, and has a silhouette of Sherlock Holmes on the wall (you know, deerstalker hat, Meerschaum calabash pipe). The image puzzled me for a bit, but a plaque on the wall explains that Arthur Conan Doyle wrote the Holmes mystery ‘The Dancing Men’ whilst staying there. So far so good. I went inside. Maybe they had a problem with the loos and maybe that’s fixed now. Never mind, not important, on to the beers. There were a good few pumps on view, so I felt optimistic. The barman looked quite young and I asked him which of his beers were most local. ‘They’re all local’, he said with the slight hint of disdain that is the mark of some rural types when addressing the obvious tourist. He waved his hand towards the pumps. Greene King from Bury St Edmunds in Suffolk, Purity from Warwickshire. 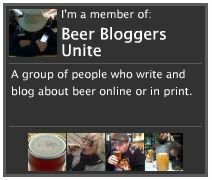 OK, so knowledge of the beer wasn’t his strong point, maybe admission of ignorance could be seen as a sign of weakness. Whatever, I plumped for a half of Greene King St Edmund’s Ale and a fruit juice for Lady A. As we sat down, the barman came over and said, ‘I’m sorry but we’re officially closed. You’ll have to go outside.’ OK, up we got, out we went. It was a pleasant day, it would be no hardship to sit outside. I took a sip of my St Edmund’s. Eew! Fine for chips, not for drinking. I dashed back in as they were trying to shut the door and explained the situation. By this time an older gent had stepped up behind the bar. ‘It’s probably the end of the barrel,’ he said, ‘I thought it was tipping a bit this morning. What can I get you instead?’ I indicated the Buffy’s Hopleaf, a beer I’d not had before but had a good reputation. He pulled the half and I went outside, narrowly missing being bowled over by the force of the pub door slamming at my back. ‘What did you get instead?’ asked m’lady. I looked at it (with hindsight, I should have done this earlier). It was opaque and turbid. ‘Horse urine, it would seem,’ I replied. Giving the sludge the benefit of the doubt, I took a sip. Holy crap! 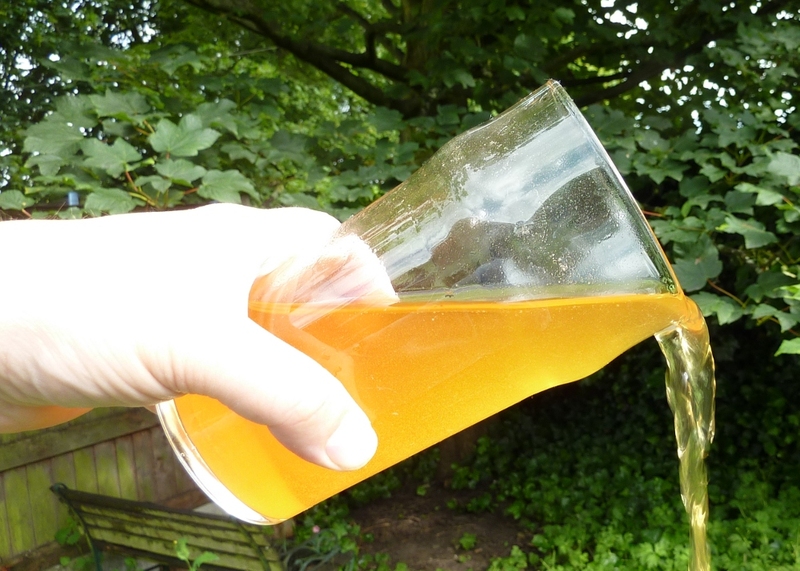 Have you ever had a really rancid cider? Imagine the very worst cider you can think of, watered down with seawater. That’s what was in that glass. Of course by now, the door was bolted shut and I had no chance of getting my money back. I just left the revolting thing on the table. The remarkable thing was that the pub was advertising a beer festival they were holding the following week with 60 real ales. Not sorry I missed that one. The House on the Hill is listed in the 2010 GBG (as the HIll House), but has been dropped from the 2011 edition. I don’t know why, but if my experience was typical, then it’s not surprising. Alright, two pubs have failed to make me happy. Big deal. I must also add the caveat that maybe I just happened on a ‘bad day’ for each of these pubs. I can only suggest that you go and see for yourselves, don’t let me put you off. More on good pubs later, ’til then, don’t have nightmares! Small But Perfectly Formed – The Vine, Norwich. The Vine, built in 1786 and the smallest pub in Norwich, closed its door as an Adnams house in 2006. In 2008, it reopened as a free house and Thai restaurant under the dynamic management of Aey Allen. During our first visit to Norwich a few weeks ago, this was the first pub we came across, and as Lady Alebagger and I are somewhat partial to Thai cuisine, we decided to ‘give it a go’. The first thing you notice is that, yes, it is small. Maybe six tables (I did count them, but I’ve forgotten!) with comfortable chairs. It looks like a very small restaurant, with the tables laid out to facilitate eating, and yet there’s a proper bar in there, too. Not like those you normally find in a restaurant, with weirdly shaped shiny silver alien spaceship-like fizz dispensers, but with four proper handpumps with four proper ales. On offer this evening were The Hanged Monk, a 3.7% mild from Tipples Brewery, Elgood Feelgood Fresh (3.8% pale ale), Oakham Scarlet Macaw (4.4% golden ale) and Wolf Coyote (4.3% bitter). I stood at the bar, and Aey immediately said ‘I know about beer; ask me about the beers!’ So I did, and she certainly did know her beers, obviously having carefully tasted each of those she was serving, as every good landlord should, of course. I settled for a jar of the Hanged Monk to start with. It’s a very dark red in colour, and light in the mouth. Dominant flavours are coffee and a hint of smoke. An excellent beer to start with. By this time, our food had arrived. We had elected to remain downstairs, but there is more restaurant seating upstairs. I find it hard to describe the food. The first mouthful just transported me to a better place. Suffice it to say that Lady A and I ate in total silence, not wishing to disturb the fabulous experience of eating this wonderful, wonderful food. Of course, once the food was done, there were still three more ales to sample, so I plumped next for the Elgood’s Feelgood Fresh. A bright yellow in colour, it has a thin head with a hoppy aroma. The taste is light and hoppy, with an interesting spicy twist which appears towards the finish and goes on into the aftertaste. It transpired that she hasn’t had any BrewDog beers on, so I suggested that she goes to Tesco and buys herself a few bottles, but added that they did tend to be a bit on the strong side. I finish off with a Wolf Coyote, the only beer on the bar that I had previously tasted. This is a complex beer, sweetish to start with a dry edge and a distinctly dry, hoppy finish. A great end to my session at a great little pub. I’ve been to many pubs which also sell themselves as restaurants. Often, it doesn’t quite work. Either the food is indifferent, or there’s a lack of care taken over the beer. It either works as a restaurant or a pub. Pubs that seriously take to the restaurant road often end up being sniffy towards drinkers, and sometimes even downright hostile. The Vine works terrifically well as both a pub and a restaurant. Whilst we were there, another couple came in for a meal, and there were several drinkers, sitting blissfully unhassled both inside and at the two tables outside. Drinkers welcome, diners welcome. Aey even served freshly cooked starters as snacks to a couple of drinkers who were sitting at the bar. If you like your beer well-kept and varied, and if you love Thai food (or are willing to give it a go – I encourage you to do so), and if you like your hostess to be friendly, knowledgeable and above all massively enthusiastic, then don’t think about going to the Vine. Just go.